UvA scientists have developed a multifunctional nanoplatform for photodynamic therapy of cancer that can be activated by absorption of near-infrared light. With this nanoplatform it has now become possible to perform simultaneously photodynamic therapy and to image the therapeutic site for evaluation of therapy efficacy with NIR illumination. The work is the result of an extensive collaboration between the group of Dr. Hong Zhang (van ’t Hoff Institute for Molecular Sciences, UvA), the group of Dr. Maurice Aalders (AMC, UvA) and the group of Prof. Xianggui Kong (CIOMP, Chinese Academy of Science) and has been published in ACS Nano, one of the top journals in the field of nanotechnology. Photodynamic therapy is an emerging therapeutic modality using photosensitizers and light irradiation to eradicate cancer tissues. Under proper light excitation the photosensitiser can, on the one hand, interact with molecular oxygen and generate cytotoxic singlet oxygen (1O2, type II) for killing cancer cells. On the other hand, the intrinsic photoluminescence of the photosensitiser can also be used for fluorescence imaging and localizing the malign tissue referred to as photodynamic diagnosis. As yet, however, phototriggered theranostics based on traditional photosensitizing molecules suffer from a low signal-to-noise ratio, small tissue penetration depth, and photobleaching of the photosensitiser. In addition, two different wavelength lights were needed for imaging and therapy, which impedes real-time monitoring and evaluating the efficacy of the treatment. 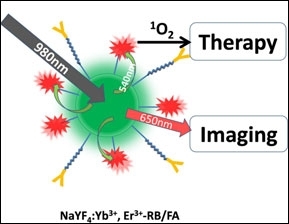 To meet the demands of high fluorescent intensity and high 1O2 production yield, Zhang and co-workers have developed a multifunctional upconversion nanoplatform that allows for simultaneous imaging and therapy. This platform is based on NaYF4 nanoparticles that are co-doped with Yb3+ and Er3+ ions. By adopting a covalent conjugating strategy to link these nanoparticles to the photosensitizer Rose Bengal, unmatched loading capacities of the photosensitizer could be obtained. The efficiency of singlet oxygen generation is so high that, in contrast to approaches used so far, its 1270 nm feature emission is readily detected. A unique feature of the nanoparticles is that absorption of near-infrared photons leads to multiple-color emission in the visible part of the spectrum. As a result, low-power near-infrared CW laser excitation can be used to generate two so-called upconversion luminescence bands peaking around 540 nm and 650 nm that can be employed for simultaneous photodynamic therapy and imaging, respectively (see scheme). Since near-infrared light is significantly less absorbed in tissue than visible light, much larger penetration depths can be obtained. In vitro experiments on cancer and non-cancerous cells have validated this novel design.